Chef Liza demonstrated three kuih recipes, – Bingka Ubi Kayu (cassava cake), Puding Nyonya Manis (layered sweet pudding) and Talam Keladi Berlauk (yam cake). I was surprised how easy it was to make these spectacular looking kuihs; all three were whipped up with what seemed like no time at all. 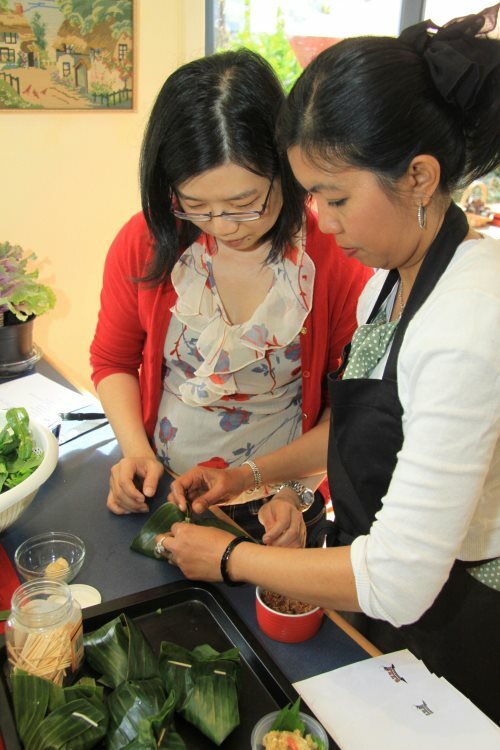 Zaida demonstratrated her fantastic otak-otak recipe. The Malay word ‘otak’ translates to ‘brain’, the imagery this dish supposedly evokes. I can’t say I agree with the supposition, but obviously the moniker stuck. Traditionally, otak-otak is a fish paste, but I much prefer Zaida’s version which has a more chunky texture while retaining all the wonderful aromatic herbs and spices. Absolutely delicious. Soak the dried red chillies in some hot water. Blend the soaked red chillies and ingredients (C) with ½ cup coconut milk until smooth. Chop the fish into small pieces, or if you have a food processor, pulse until the meat consists of small chunks. Marinade the fish with salt and sugar. Mix in the 2 light beaten eggs, lemon juice and cornflour. Then, pour over the spice blend, and fold until well blended. To make the otak-otak ‘bungkus’ (parcel), place a piece of daun kadok or young spinach leaf in the middle of the steamed banana leaf, then two tablespoonful of fish mixture and fold, and secure the ends with skewers. Always fold with the grain, the leaf can tear if you fold against the grain. Steam for 10 minutes, and serve. These parcels can also be baked at 180°C for 15 minutes. Fantastic on their own, or serve with rice or lemang (coconut rice).